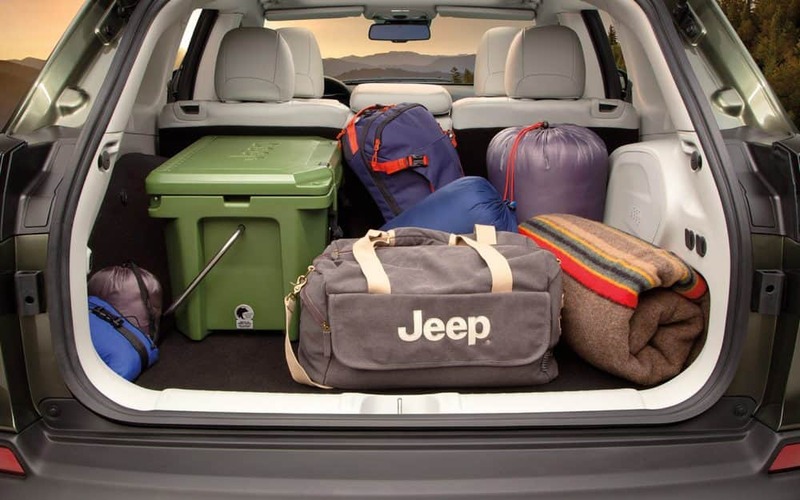 The 2019 Jeep Cherokee is crafted for more! There is nothing that this SUV can't do from the trails to the highway. The new exterior design will turn heads while the interior has been updated for utmost comfort! 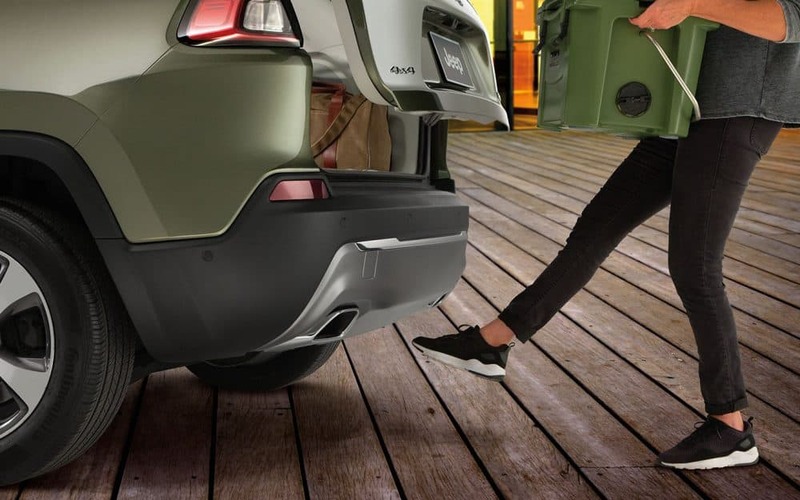 Plus cargo space has been increased for 2019, so there is room for everyone and all their gear no matter what kind of adventure you've got planned. 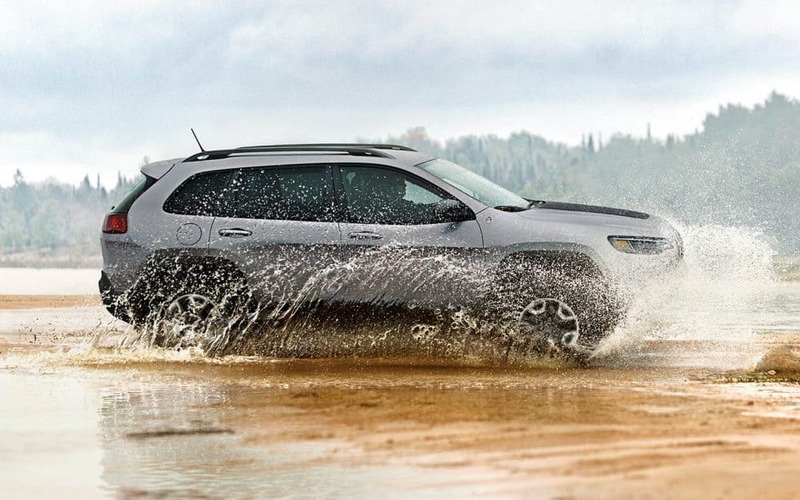 Check out the rest of our 2019 Jeep Cherokee review to learn even more about this incredible SUV. What kind of new and standard features does a 2019 Cherokee come with? The Cherokee was completely redesigned for the 2019 model year but the design still stays true to the classic and iconic Jeep look we all know and love! The brand new front fascia, daylight running lamps, LED headlamps, hood, and fog lamps create a unique and bold look. 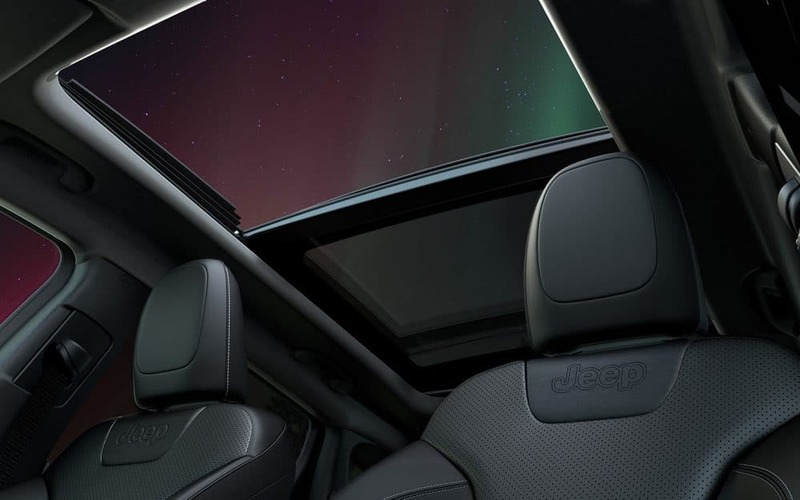 Plus the available dual-pane sunroof give drivers the open air experience that Jeep is known for! 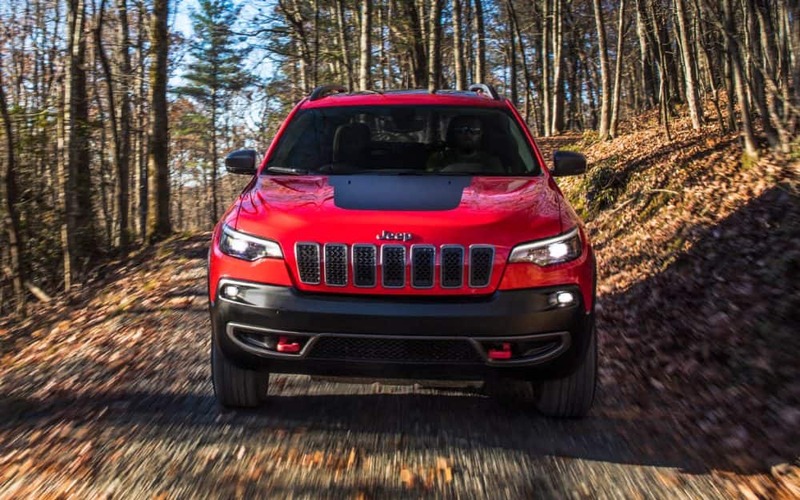 The Cherokee is available in five trim levels: the Latitude, Latitude Plus, Limited, Overland, and the Trailhawk. Standard features for 2019 include variable intermittent windshield wipers, six-way manual front seats, speed sensitive power locks, a rear seat with 60/40 split with recline, a tilt-and-telescoping steering wheel, and rear reading lamps. As well as a 12-volt auxiliary power outlet, a rear armrest with cupholder, eight cargo tie-down loops, and power windows with driver auto up, overhead console with sunglass holder, air conditioning, a locking glove box. 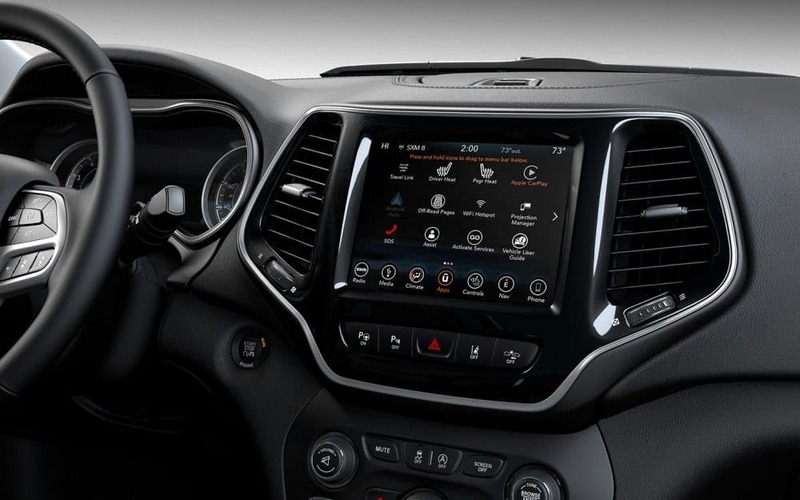 Standard technology features include a USB port, a 7-inch touchscreen interface, Bluetooth connectivity, and Apple CarPlay and Android Auto smartphone integration. What kind of safety and security can a 2019 Cheroke provide me? 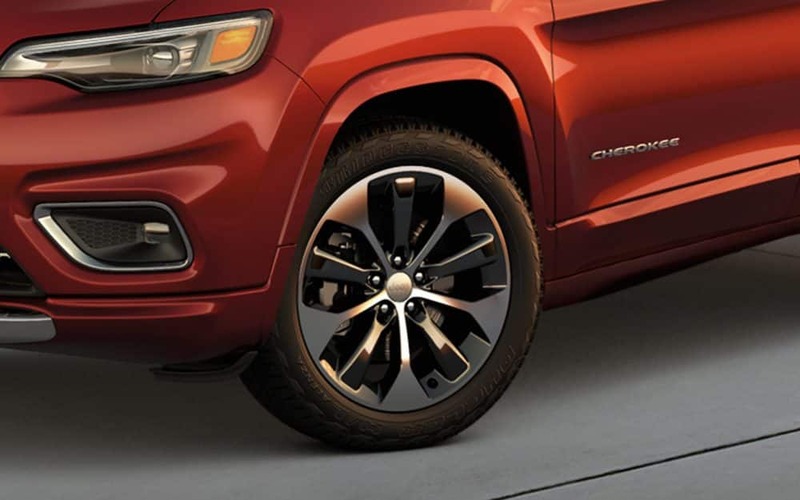 When it comes to safety and security the Cherokee offers more than eighty features for the 2019 model year. The body of the Cherokee is created with 65% high-strength steel for superior protection in the event of an accident. You'll find standard features like a suite of eight airbags, a rear backup camera with dynamic gridlines, the LATCH system, keyless entry, hill start assist, electronic stability control, electronic roll mitigation, and all-speed traction control. Available features include adaptive cruise control, parallel and perpendicular park assist, forward collision warning-plus, SOS button, lane departure warning, and blind spot monitoring. What type of enigne options does a brand new 2019 Jeep Cherokee offer? There are a few different engines for the 2019 Jeep Cherokee, including a brand new option! The standard choice is the fuel-efficient and capable 2.4-liter MultiAir2. This Tigershark engine comes equipped with engine start-stop (ESS) technology and cranks out 180 horsepower and 170 pound-feet of torque. For superior performance and reliability opt for the trusted 3.2-liter Pentastar V6. This engine also comes with ESS, produces 239 pound-feet of torque and 271 pound-feet of torque, and offers drivers a best in class towing capability of 4,500 pounds! The final engine option is brand new for the 2019 model year! This new 2.0-liter direct-injection turbocharged 4-cylinder engine delivers the ultimate power! Cranking out 295 pound-feet of torque and 270 horsepower this engine is a beauty! ESS is also present with this engine and helps reduce the Cherokee's greenhouse gas emissions. Jeep connects all three of these engines with an enhanced nine-speed automatic transmission! There are also three 4x4 systems available for the 2019 Cherokee! 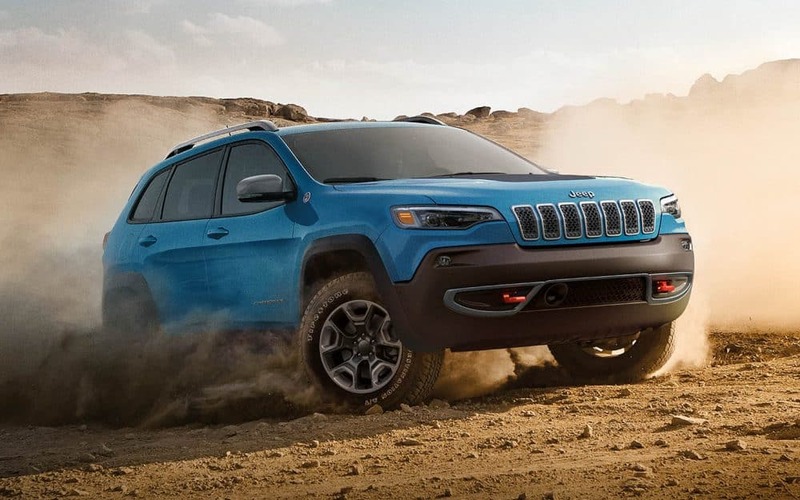 We love the 2019 Jeep Cherokee and we know that you will too! To learn more come and visit us at Foss Motors today! Still, have a few questions about this SUV? GIve us a call at (844) 532-7406 or fill out the contact form below and will give you a ring!